MIAMI_Royal Caribbean's newest, biggest and grandest ship – Symphony of the Seas – made its official debut here during a preview cruise for travel agents, media and special guests. It's the fourth Oasis-class ship in the fleet, joining Oasis, Allure and Harmony. Symphony is everything you loved about those ships, and more. Drawing heavily from guest feedback, President/CEO Michael Bayley talked about the ship's 25 percent improvement in efficiency as well as the addition of features like Playmakers Sports Bar and new dining options, like Hooked seafood restaurant. Every new Oasis-ship can proudly claim the title of “largest cruise ship in the world,” and Symphony now has that honor, with marginally more tonnage than Harmony. At capacity, it will carry over 6,000 guests and 2,000 crew. Throughout, Symphony reflects the refinements, attention to detail and lessons learned. Despite its size, you never feel lost, thanks to an abundance of signage, both digital and real. Royal has also worked hard on its app, which provides your personal cruise details, a daily planner, a personal calendar and what you need to know about all the ship's myriad things to do. Available in both IOS and Android, it will gradually roll out to all the ships in their fleet. We boarded through the distinctive glass facade of the Port of Miami's new Terminal A, built by Royal to handle megaships like Symphony, where they scanned our passport photos on entry. Upon arrival back, the biometric facial recognition units made going through Customs a breeze. The ship is indeed beautiful. 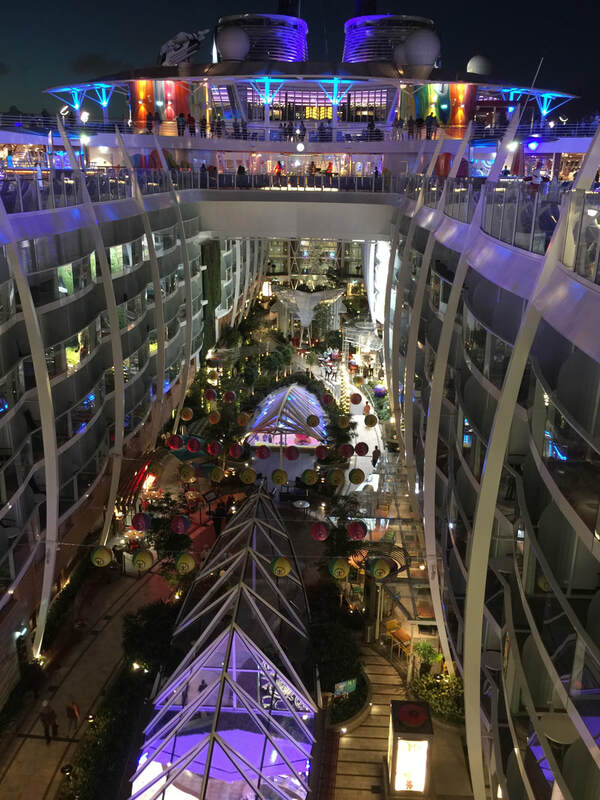 First-time cruisers are no doubt in awe as the enter on Deck 5 and find themselves walking along a dazzling boulevard of shops, restaurants and nightclubs, interspersed with million-dollar artworks that reach into the soaring elevator atriums. Day and night, it's a mesmerizing smashup of sights and sounds. Royal executives onboard talked about their mission: Create the ultimate family vacation. This ship is built to deliver exactly that, regardless of age group. There are so many activities and features to choose from, I'm not sure we could have gotten to all on them if we had two weeks instead of two days. Speaking of “ultimate,” one of the new additions to Symphony is the Ultimate Family Suite on Deck 17. It's two stories of family fun, including a bright orange slide that connects the top floor to the bottom. There's pretty much everything you could want, including a media room, table tennis, a hot tub on an oversized balcony and your own personal “Royal Genie” – a concierge to attend to your every need. The cost? It currently ranges from around $30,000 to $80,000, depending on the voyage. Royal's onboard entertainment continues to be second to none. Along with an updated version of the Broadway hit “Hairspray,” Nick Wier, senior vice president for entertainment, and his team offer an amazing journey through the history of “Flight,” a jaw-dropping ice show, “1977,” and a frenetic display of aerial and water artistry in the Aqua Theater, “Hiro.” The production values rival anything you might see on land. They have expanded the Solarium – an adults-only area -- into an inviting retreat you probably won't want to leave. It has its own outdoor bar under a cascade of colored light sculptures and a dining bistro as well. There was also a lot of talk about the upcoming expansion of their private island, Coco Cay. Opening next May, we donned VR headsets to get a virtual tour of what will be a full-featured water park featuring the largest freshwater pool in the Caribbean, as well as overwater cabanas guests can rent for the day. The theme is “Chills and Thrills,” and Royal is spending $250 million to over-deliver on both. I have to also give Royal props for adding extra plugs in the staterooms. It's the first time we didn't have the use the six-power strip we always pack for cruises. Well, even on the largest cruise ship in the world, it's still the little things, right? Symphony of the Seas features top-flight entertainment, like the mesmerizing ice show "1977," a compelling journey through the history of "Flight" and the high-energy, water and air production, "Hiro." SEE MORE HERE. It's split-level, features a big orange slide, accommodates eight and costs up to $80,000 to book. Royal Caribbean calls it the "Ultimate Family Suite." READ MORE. Three years ago, Jim Berra, Royal Caribbean's Chief Marketing Officer, said the cruise line had a vision of what a "perfect day" might be for their guests. Combine their private island, Coco Cay, and $250 million, and that vision is about to become reality.